Export Novell GroupWise address book to outlook default profile directly. Allow to migrate Novell address book to outlook new PST file. Support transfer of Novell address book (NAB) to outlook address book (.vcf File). Export Bulk or unlimited number of NAB contacts at once. Convert complete data of NAB to PST including all images & notes. Support any version of MS outlook 2000, 2003, 2007, 2010, and 2013. Export GroupWise contacts to outlook PST file with convert NAB Tool. Software directly export all contacts into new PST file without affecting the integrity of NAB File. Novell address book converter migrate entire list of GroupWise contacts to the default configure outlook profile directly in just few clicks. Transfer GroupWise contacts to outlook supported VCF or vCard format. Not only outlook but also other application accept contacts as VCF file format. VCard is consider to be widely accepted contacts file format. NAB to Outlook Converter maintain all fields of GroupWise contacts as original as it was before conversion. Fields like full name, address, telephone, email address, webpage address, tasks and other will remain intact while converting into outlook contacts. NAB Converter tool offer an easy to use graphical user interface that facilitate any non-technical user to perform migration of NAB to PST effortlessly. Convert NAB to PST irrespective of the number of contacts it has as the software can handle or export unlimited contacts of Novell GroupWise into PST flawlessly. Step 1: Launch Notes address book Software on your system. Step 2: Click on Browse button to select NAB file. Step 3: Select appropriate export option for Converting NAB file. Step 4: Specify destination location and click on Export button. Watch Convert NAB tool video to quickly assimilate with the functionality and working of NAB converter tool. This interactive video contain an overall sequence that will guide our user in the right direction. Do I convert NAB into PST using this tool on windows 10? Is this tool preserve the integrity of GroupWise contacts? Is there any limitation on number of contacts can be exported from GroupWise to outlook? 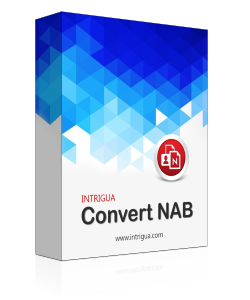 No using full licensed version of Convert NAB tool you can convert multiple or entire NAB contacts into PST contacts. Can I convert a multiple number of NAB contact files all at once? Yes, convert NAB software can migrate bulk names.nsf file to PST or vCard very easily. Even there is no restriction on the file size to perform NAB conversion. 20 MB of free hard disk space should be available to run Convert NAB software. Support MS Outlook version 2016, 2013, 2010, 2007, 2003, 2000 (32 / 64 bit - Any Version of MS Outlook). Microsoft Windows are supported by Convert NAB software including Windows 10, 8.1,8, 7, Vista, XP, 2008, 2005, ME, & NT (Any Version of Microsoft Windows). Really an amazing software. I converted about hundreds of my contacts from NAB to PST file format with just few clicks. It has simple graphical user interface, which makes easy for me to perform the conversion. Thank you INTRIGUA.